The 50th anniversary edition of this classic World War 2 adventure set in south-east Asia. February, 1942: Singapore lies burning and shattered, defenceless before the conquering hordes of the Japanese Army, as the last boat slips out of the harbour into the South China Sea. On board are a desperate group of people, each with a secret to guard, each willing to kill to keep that secret safe. Who or what is the dissolute Englishman, Farnholme? The elegant Dutch planter, Van Effen? The strangely beautiful Eurasian girl, Gudrun? The slave trader, Siran? The smiling and silent Nicholson who is never without his gun? Only one thing is certain: the rotting tramp steamer is a floating death trap, carrying a cargo of human TNT. Dawn sees them far out to sea but with the first murderous dive bombers already aimed at their ship. Thus begins an ordeal few are to survive, a nightmare succession of disasters wrought by the hell-bent Japanese, the unrelenting tropical sun and by the survivors themselves, whose hatred and bitterness divides them one against the other. 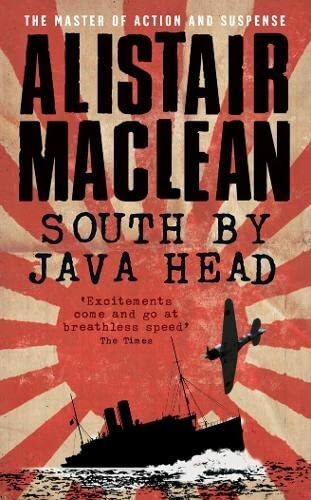 Written after the acclaimed and phenomenally successful HMS Ulysses and The Guns of Navarone, this was MacLean's third book, and it contains all the hallmarks of those other two classics. Rich with stunning visual imagery, muscular narrative power, brutality, courage and breathtaking excitement, the celebration of the 50th anniversary of South by Java Head offers readers a long-denied chance to enjoy one of the greatest war novels ever written.